On its 25th anniversary, a group of scientists looked back at that first warning to evaluate humanity’s response. What they found was most distressing. With the exception of curtailing depletion of the ozone layer protecting life from the sun’s damaging UV radiation, humanity had failed to make progress in solving the challenges originally documented. Instead things had gotten far worse. This group formed the Alliance of World Scientists. 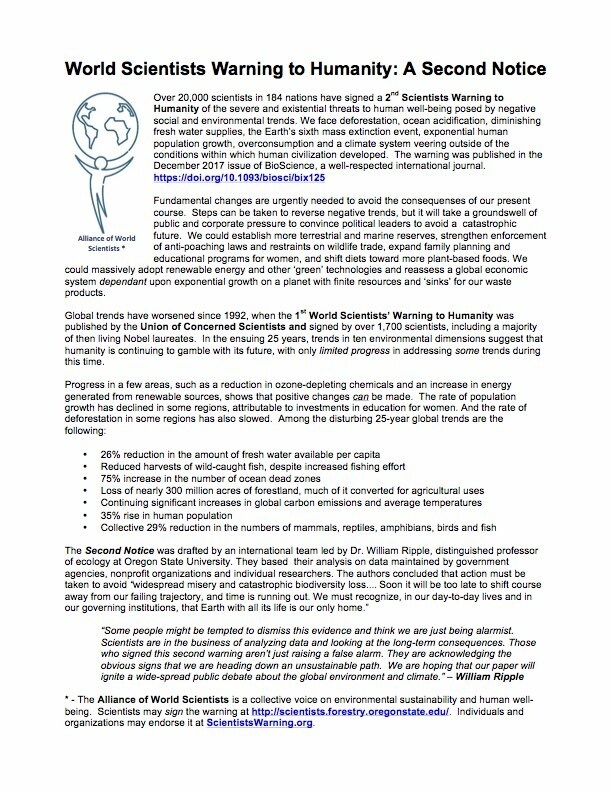 Their study, entitled World Scientists’ Warning to Humanity: A Second Notice was published in the prestigious journal BioScience, available here. An abstract (summary) of this Second Notice appears below as an image (non-working links), but can be downloaded as a PDF with working links here.